It's official! Meghan Markle and Prince Harry are married! 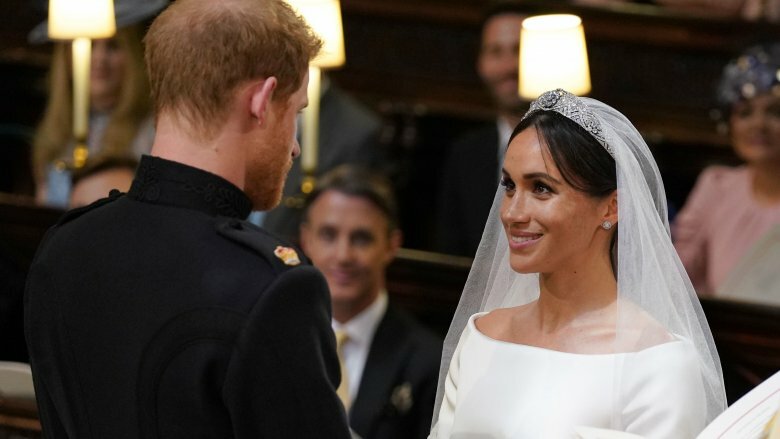 On May 19, 2018, the world watched with rapt attention as the royal couple tied the knot in an unforgettable ceremony at St. George's Chapel at Windsor Castle following a six-month engagement. Markle stunned in her gorgeous Givenchy gown, paired with Queen Mary's diamond bandeau tiara, while the prince looked handsome in his Blues and Royals frock-coat uniform. In front of their 600 guests, including celebs Oprah Winfrey, Serena Williams, and Amal and George Clooney, the newlyweds exchanged their vows and beautiful gold rings by Cleave and Company. Following their real-life fairy tale wedding, the newly married pair shared a first public kiss on the steps of the chapel, before taking a carriage ride to greet thousands of well-wishers who had gathered outside of the castle. But that's just what we all saw televised live during the ceremony. What about all of the action behind the scenes? Here's what you didn't see at the royal wedding. Oprah Winfrey nearly broke the No. 1 cardinal rule of wedding attire: unless you're the bride, you must never wear white! As Winfrey's bestie Gayle King revealed on CBS This Morning, the talk show host "had a little bit of a wedding emergency yesterday" when she realized the cream dress she'd planned on wearing to the ceremony was actually bright white. Oprah reportedly "whipped together" an alternate outfit at the last minute. Not to be deterred by the fashion fiasco, the queen of all media was one of the first celebrity guests to arrive at Windsor Castle. She looked amazing in her new pink dress with lace trim, courtesy of designer Stella McCartney. 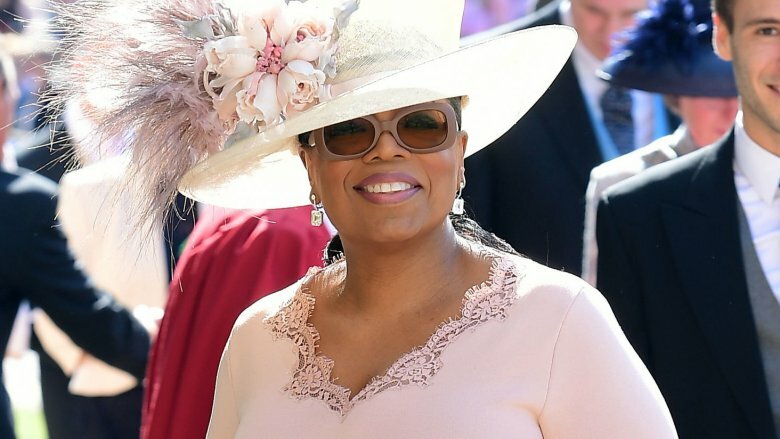 Winfrey's outfit was completed with a Gabriela Hearst purse and a wide-brimmed hat adorned with flowers and feathers and designed by Philip Treacy. While heading into the chapel, Winfrey appeared to be chatting it up with Idris Elba, who was accompanied by fiancée Sabrina Dhowre. Oh, to be a fly on the wall. Just days ahead of the royal wedding, Markle confirmed that her father, Thomas Markle, would not be attending the ceremony after undergoing heart surgery amid the media frenzy surrounding his staged paparazzi photos. "Sadly, my father will not be attending our wedding. I have always cared for my father and hope he can be given the space he needs to focus on his health," the actress said in a statement. Because Thomas was under doctor's orders not to travel overseas until he was fully recovered, he watched his daughter tie the knot from home, much like the rest of the world. However, the proud dad was with his little girl in spirit. "My baby looks beautiful and she looks very happy," the lighting director told TMZ just after the ceremony. Calling it an "emotional and joyful" experience, he added, "I wish I were there and I wish them all my love and happiness." While the royal couple's big day seemed to go off without a hitch, there was one slightly awkward error: the ceremony's official program listed Markle's father as the person set to walk her down the aisle, rather than Prince Charles. Kensington Palace clarified that the programs had already been printed before the last-minute change, stating, "The Order of Service was produced before it became clear that Mr. Thomas Markle would be unable to attend the wedding on medical advice…"
As Nicki Swift previously reported, Markle asked Prince Harry's father to take her father's place in the ceremony a day before the nuptials. 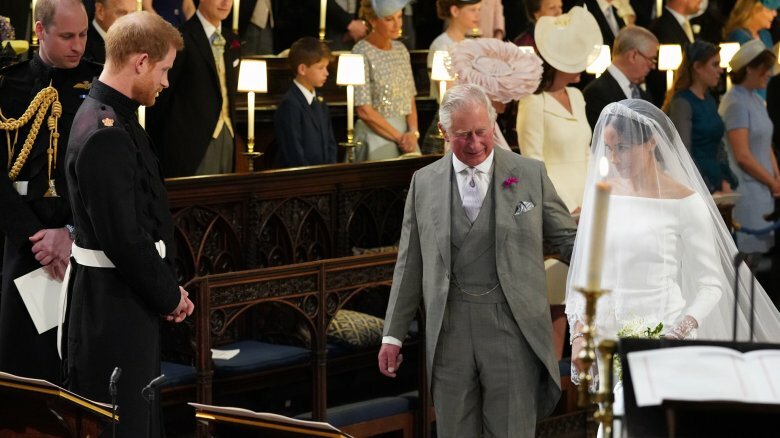 "Prince Charles is very touched to be asked by Meghan to walk her down the aisle," a source told Us Weekly at the time. "And he is very much looking forward to welcoming her into the family." For his part, Thomas told TMZ that he was "honored and grateful" the prince could fill his shoes. The bride and groom honored Prince Harry's late mother, Princess Diana, in special ways on their big day. According to E! News, the prince hand-picked a number of "delicate blooms" for his bride-to-be's bouquet from their garden at Kensington Palace. In memory of his mom, who tragically died in a car crash in Paris in August 1997, the British royal included her favorite flower: forget-me-nots. Prince Harry and Meghan Markle also enlisted the help of floral designer Philippa Craddock, who created a special arrangement of flowers for the entrance of the chapel that included white garden roses, another favorite of Princess Diana's. The rest of the wedding ceremony included a number of tributes to the "People's Princess." According to Variety, the hymn sung at her funeral, "Guide Me, O Thy Great Redeemer," was included in the service. Additionally, her good friend, Sir Elton John, and her siblings, Lady Sarah McCorquodale, Lady Jane Fellowes, and Earl Charles Spencer, were invited to the nuptials. The former Suits actress' TV family couldn't have been happier for her on her big day. While a number of Markle's co-stars, including Rick Hoffman, Gina Torres, Sarah Rafferty, and Abigail Spencer, made the trip to England to attend the royal wedding, her TV husband, Patrick J. Adams, also showed his support with a sweet message on social media. "Going to bed now and thinking a lot about the strange surreal and wonderful day my friend Meghan is going to have tomorrow," tweeted Adams, who also shared a pic from the cast's "last supper" before the nuptials. "Meghan — wherever you are — we are so grateful to be here to watch you both take this monumental step together. Love deeply and live well. #RoyalWedding." Unfortunately, Markle's TV dad, Wendell Pierce, wasn't able to join the royal festivities. He told Entertainment Tonight that he was "irrationally happy" for the couple, adding, "[I] will be up in the morning with champagne, strawberries and cream, watching." Sweetest cast ever. 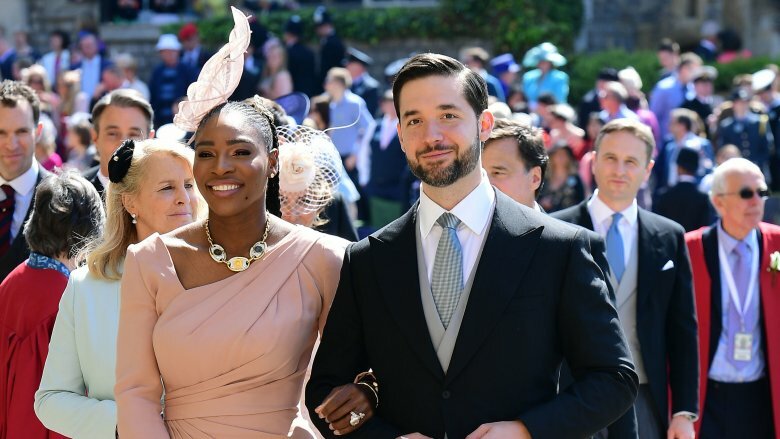 Serena Williams gave fans an inside look at what it's like to prepare for a royal wedding by keeping a behind-the-scenes diary of herself and husband Alexis Ohanian on her Instagram Stories. "I've known [Meghan] for so many years and I'm so happy for her," the tennis pro said in one of the many videos (and snapshots) she shared, which featured plenty of glam time and adorable appearances by their baby girl, Alexis Olympia Ohanian, Jr. The power couple, who married in November 2017, showed off its wedding style at the chapel. Williams looked gorgeous in a long-sleeve, blush dress by Versace, complete with a matching hat and braided ponytail; Ohanian looked dapper in a black tux. "I couldn't be happier for her," Williams told Good Morning America in April 2018, before sharing some sage advice with Markle (via E! News). "It's so important to enjoy the moment. Eat the cake! I didn't get to eat mine at the wedding. We were just having so much fun!" 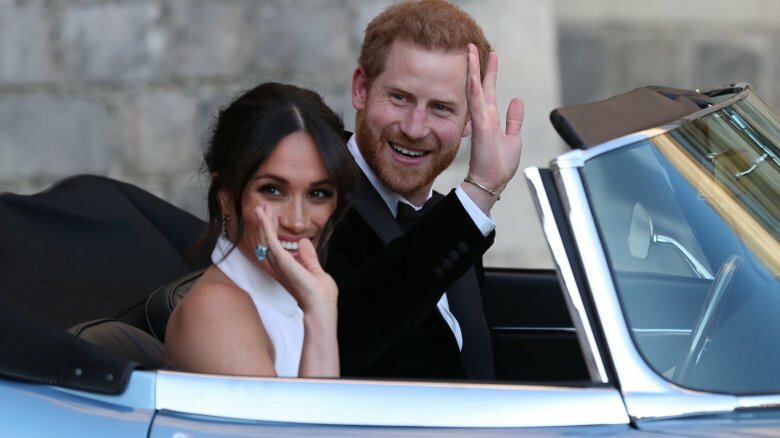 Perhaps the most relatable moment of Prince Harry and Meghan Markle's big day came at the end of the couple's traditional carriage ride through the town of Windsor. 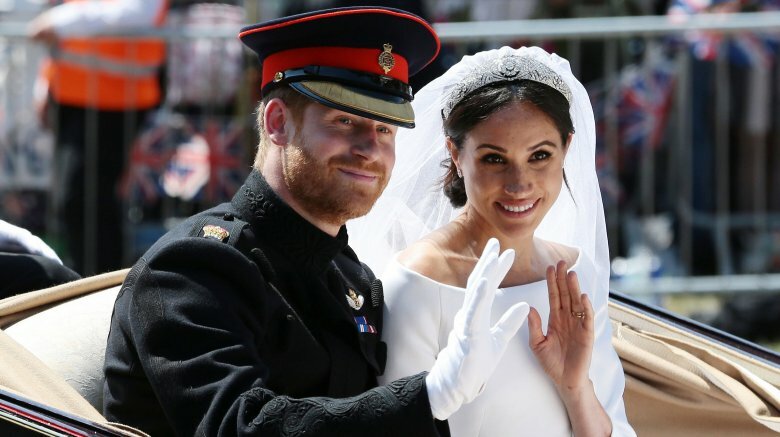 As the newlyweds re-entered the gates of Windsor Castle following their beautiful processional, the excitement of what had just transpired in front of millions of people worldwide seemed to catch up to the duchess, who could be seen clutching her chest and saying, "Oh my god," with a big smile to her new husband. Markle wasn't the only one overwhelmed by the life-changing day. During the ceremony, Prince Harry appeared to be moved to tears as his bride walked down the aisle. According to Us Weekly, fans on social media speculated that he told his bride-to-be, "You look amazing. Absolutely gorgeous. I'm so lucky," as they met at the alter. How sweet is that? 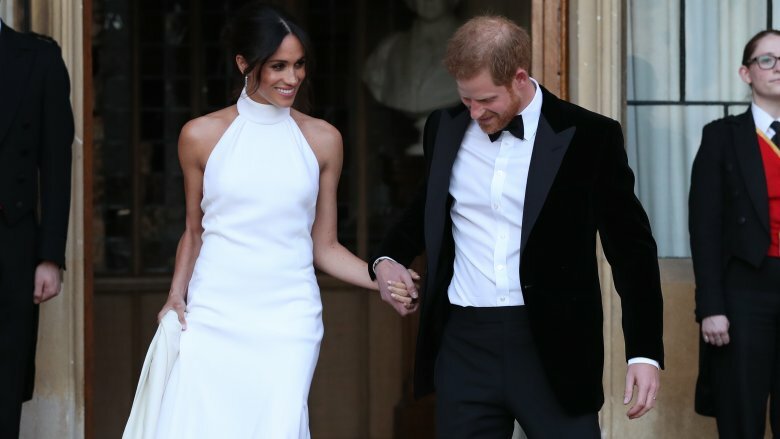 Markle's best friend, Canadian fashion stylist Jessica Mulroney, became an internet sensation before the ceremony even began. According to Town & Country, the bride's unofficial maid of honor wore a blue dress designed by Antoinette Di Carlo, which featured button details on its cap sleeves, along with "flawless tailoring." Mulroney's ensemble, complete with her half-up, half-down hairdo, was reminiscent of Pippa Middleton's iconic maid of honor style — particularly from behind. Middleton famously donned a white, fitted Alexander McQueen dress when her sister, Kate, married Prince William in 2011, and instantly became known for her pert posterior. According to the Daily Mail, Mulroney had a "Pippa moment" of her own as she guided young bridesmaids into St. George's Chapel. While Mulroney's royal wedding look may have been a matter of coincidence, Page Six sources claimed it was a "calculated move to promote herself." At a gala in Toronto a month prior to the wedding, on insider said Mulroney told a prominent photographer, "I'm going to give you some Pippa" and then "turned her back to offer a rear shot … that's Jessica for you." 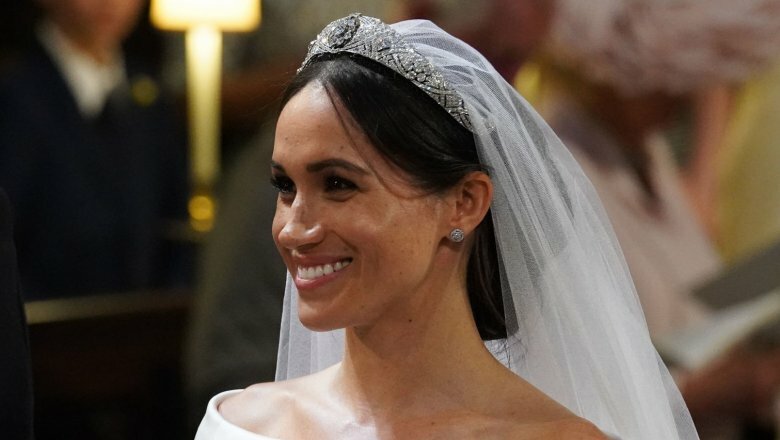 Markle's hairdo had the internet abuzz during her wedding ceremony. Styled by Serge Normant, the duchess' hair was left in a low bun. 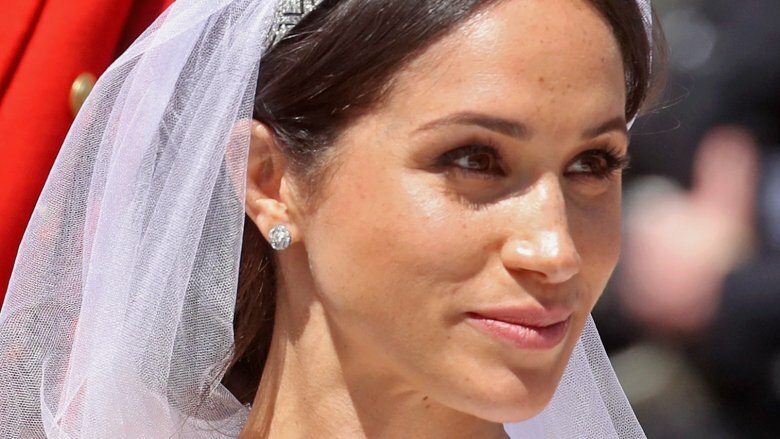 While the simple look was undoubtedly gorgeous, Markle's usual face-framing layers eventually began to stray as the wedding continued, poking out from behind her ears and covering her forehead. And Twitter basically freaked out. "Meghan Markle looks stunning in @givenchy but that one piece of unruly hair that's separated from the rest is going to haunt me for life," one person wrote. Another tweeted, "Meghan Markle's hair is coming undone and I want to jump into the tv screen and fix it. I can't focus on anything else." Meanwhile, another Twitter user offered the newest British royal a piece of advice, writing, "Meghan Markle we understand you are revolutionizing the messy bun here but your wedding day is not the time to allow a loose piece of hair #bobbypins." Did the royal couple forget to bow to the queen? When the newly married pair walked up the aisle together after being pronounced husband and wife, royal wedding viewers immediately took to social media to share concerns over whether or not Prince Harry and Markle remembered to respectively bow and curtsy to Queen Elizabeth. "Did Meghan not curtsy to the Queen or did I just miss it?!" 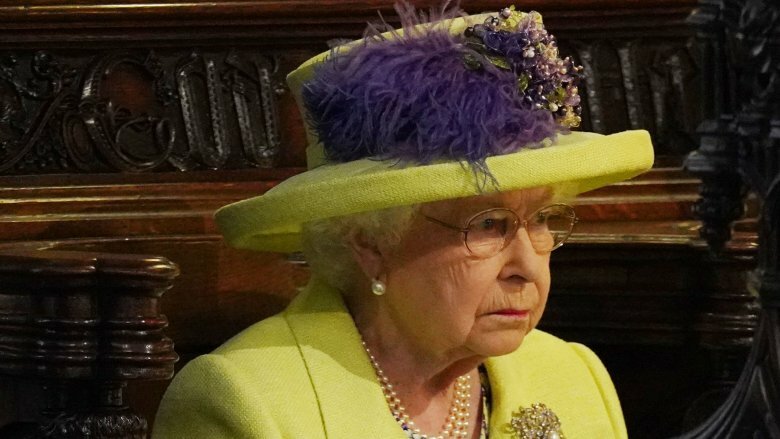 one person wrote, while another tweeted, "Could someone please tell me why she did not curtsy to the Queen? Is this a new protocol? Because she is American? Because she forgot? What?" Fear not! It turns out the newlyweds did not break royal protocol. According to Time, the perceived faux pas was simply a case of camerawork. When the royal couple paid its dutiful respects to the queen, the camera moved from a close-up to a wide shot, turning this age-old tradition into an easy-to-miss moment. The royal couple's fairy tale wedding stirred up a number of mixed emotions. 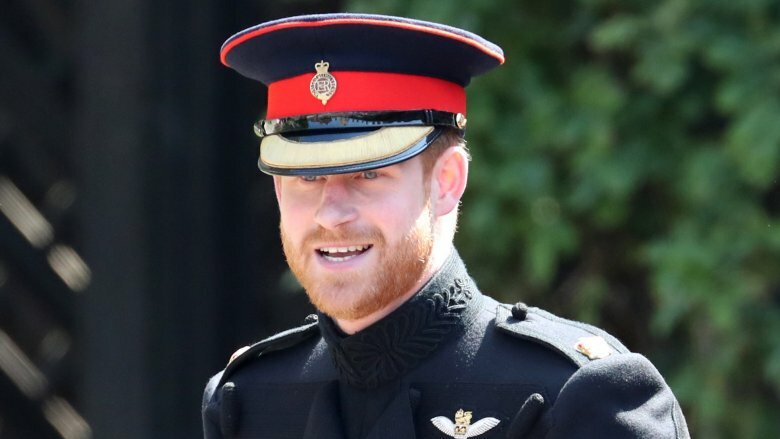 According to Entertainment Tonight, Prince Harry delivered a moving speech in honor of Princess Diana at a luncheon reception. The event, which was attended by 600 guests, was hosted by the queen at St. George's Hall in Windsor Castle. "Harry gave a tearful speech paying tribute to his own mother missing from the festivities," a source told the publication. "He also thanked Meghan's mother [Doria Ragland] for giving him permission to marry Meghan. He talked about how they made a great team." He called his new mother-in-law "one in a million," an insider told Us Weekly, and added that his bride "has handled things with grace and dignity. [He said] that he can't wait for them to be a team." Both sources reported that whenever the Duke of Sussex referred to the duchess as his "wife," their guests cheered. 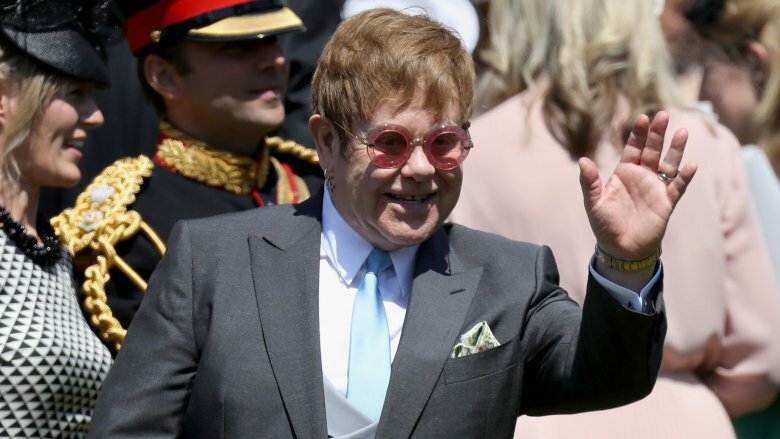 Sir Elton John is officially a royal wedding singer! In celebration of the duke and duchess' nuptials, the music icon performed at their luncheon reception. According to an Entertainment Tonight source, the prince had asked if anyone could play piano during his speech, prompting John to volunteer. The "Candle in the Wind" singer entertained the crowd with renditions of "The Circle of Life," "Tiny Dancer," "Your Song," and "I'm Still Standing." "It is no surprise that Elton has been included in Prince Harry's wedding," another insider told Entertainment Tonight. "As one of Diana's closest confidantes, Elton is a connection to Harry's mother and a very supportive friend." After performing at the coveted gig, John took to Twitter to celebrate the young couple's matrimony with a Maya Angelou quote. "Love recognizes no barriers," the post read. "It jumps hurdles, leaps fences, penetrates walls to arrive at its destination, full of hope." Markle managed to turn her "something borrowed, something blue" into another touching tribute to Prince Harry's late mother. As Kensington Palace confirmed to E! News, the bride sported a giant emerald-cut aquamarine ring to the evening reception — the same ring Princess Diana wore in October 1996. 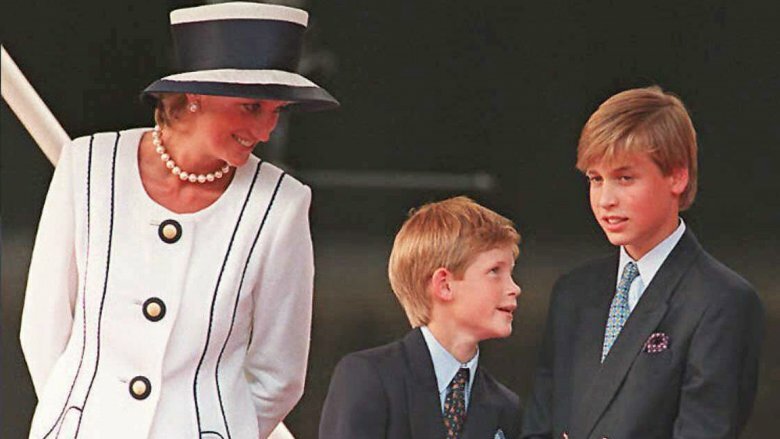 Markle has worn Diana's jewelry before. Her engagement ring, which was designed by Prince Harry, included two diamonds from his mother's collection. The idea was "to make sure she's with us on this crazy journey together," Harry told the BBC after he proposed in November 2017. During their joint engagement interview, Markle also acknowledged Diana's memory, saying, "…obviously not being able to meet his mom it's so important to me to — to know that she's a part of this with us." After a full day of pomp and circumstance, the bride and groom were finally able to let loose at their evening reception. According to the Mirror, the newlyweds' first dance was set to Whitney Houston's "I Wanna Dance with Somebody." Afterward, actor Idris Elba reportedly deejayed as Prince William, Kate Middleton, and their closest celeb friends took to the dance floor. The royal brothers' pal, Charlie van Straubenzee, apparently roasted Prince Harry in a "hilarious and naughty speech," a source told Entertainment Tonight. The insider added, "It left the crowd in stitches. William had warned Harry before the wedding that it was payback time." And the older royal wasn't kidding. The Duke and Duchess of Sussex reportedly left their after-party around midnight, but not before the Duke of Cambridge played a prank on his younger brother. "Apparently Harry fell off a ladder recently while changing a light bulb for Meghan and hurt his arm," a source told the Mirror. "So Will tied a ladder to the back of the car, which nearly floored a few people."